Aim: We investigated outcomes of sublobar resection in patients with clinical early-stage nonsmall cell lung cancers. 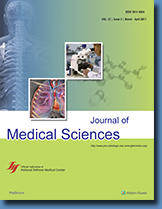 Patients and Methods: Patients who underwent surgical resection between January 2002 and June 2013 were reviewed. The clinical data, surgical approach, and outcome were analyzed with mean follow-up of 108 months. Results: Of 597 patients, 108 (18.1%) underwent sublobar resection. The 5-year overall survival (OS) and disease-free survival rate for this group were 76.2% and 70.3%, respectively, compared with 79.7% and 73.0% for those undergoing anatomic resection (P = 0.709 and 0.618). After stratifying for tumor size <2 cm, 233 patients with T1a lesions were enrolled in this study. The 5-year OS and disease-free survival rate for 69 patients who underwent sublobar resection were 96% and 87%, respectively, compared with 93.4% and 89.7% for those undergoing anatomic resection (P = 0.760 and 0.868). The local recurrence rate was 3% in the sublobar resection group and 8.5% in the anatomic resection group. 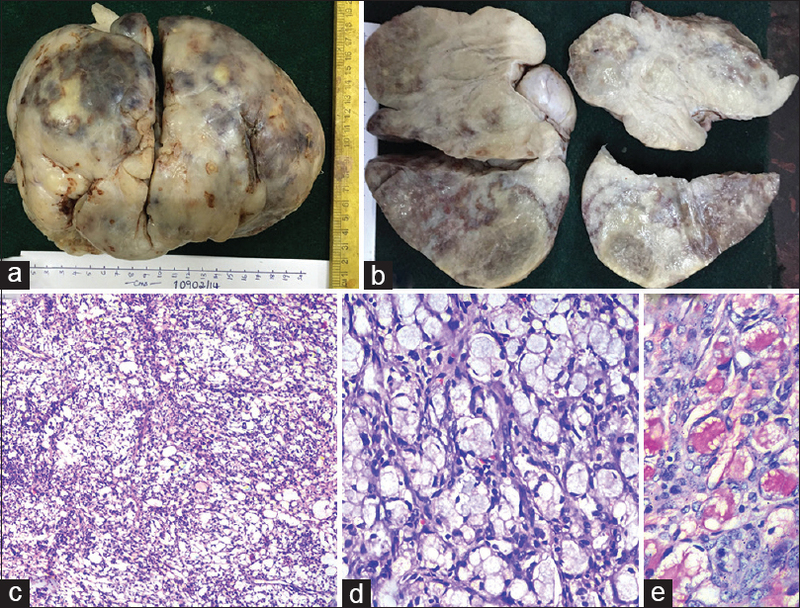 There were no significant differences in age, gender, histopathology type, maximum standard uptake value, lymphovascular space invasion, visceral pleural invasion, and epidermal growth factor receptor status, except in the grade of tumor differentiation and numbers of dissected lymph nodes: 13.16 ± 6.62 in the anatomic resection group and 7.34 ± 4.91 in the sublobar resection group (P < 0.01). In the sublobar resection group, 28 patients underwent segmentectomy without local recurrence during follow-up. Conclusions: The oncologic outcomes of sublobar resection were similar to anatomic resection in these patients; lymph node sampling might not compromise surgical outcomes. Further large-scale studies are necessary to clarify the difference in clinical outcome between segmentectomy and wedge resection. Aim: This study was aimed at assessing dispositions, attitudes, and behavioral tendencies for HIV/AIDS-related stigma and discrimination among health-care providers in Specialist Hospital Gombe, Northern Nigeria. Materials and Methods: Out of a total of 397 health personnel of the hospital, a sample of 201 health-care providers of various professional backgrounds was drawn using quota sampling technique. A descriptive exploratory survey method was adopted. Using a structured questionnaire, relevant data were collected from the subjects. Reliability test on key segments of the instrument yielded alpha Cronbach's internal consistency test values of not <7.0. The significance level for findings was set at 0.05. Results: The subjects were aged between 18 and 59 years with a mean of 39.11 ± 10.60 years. There were more females (123, 61.2%) than males (78, 38.8%), and majority (113, 56.2%) of them were diploma certificate holders, whereas a good number (62, 30.8%) had degree education. Seventy-two (35.8%) of them opined that “A person who contract HIV should be ashamed” and another 31 (15.4%) of them believe that such a person should be rejected. Although this tendency appeared to be more among doctors (31, 15.4%) and laboratory workers (4, 25.0%) than others, this was not statistically significant (P > 0.05). If given the choice, 34 (16.9%) of the personnel would not treat a patient with HIV. Conclusion: A prevalence rate of HIV/AIDS-related stigma of 15.4% among the health personnel is quite worrisome. Stigma reduction seminars and workshops would go a long way toward mitigating this trend. Background: Scabies is an infectious inflammatory skin disease, and rheumatoid arthritis (RA) is also an immune-medicated inflammatory disease. Immune-mediated inflammatory processes result in the pathophysiologic mechanism in both diseases. Only a few studies have investigated the possible association between scabies and RA. Methods: This nationwide population-based study included 5135 patients with scabies as the study group; 19,115 people chosen from the National Health Insurance Research Database of Taiwan formed a control group. We tracked patients in both groups for 7 years to identify newly diagnosed cases of RA. Demographic characteristics and comorbidities were analyzed. Cox proportional hazards regressions were performed to calculate the hazard ratio (HR) of RA during the 7-year follow-up period. 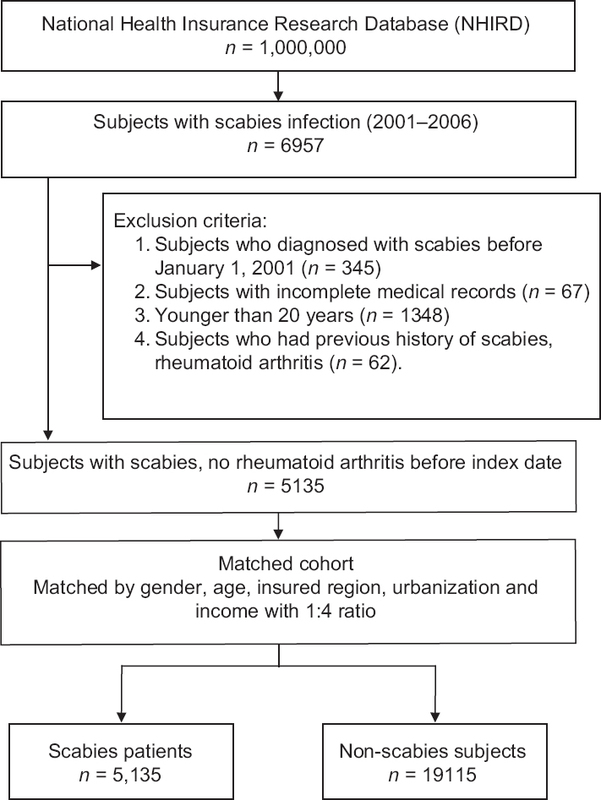 Results: Of the 24,250 patients enrolled in this study, 217 (0.9%) were diagnosed with RA during the 7-year follow-up period; 61 (1.2%) were from the scabies group and 156 (0.8%) were from the control group. The data showed that patients with scabies had a higher risk of subsequent RA, with an HR of 1.46 (95% confidence interval = 1.09–1.96). Conclusions: The results indicated an increased risk for RA among the patients with scabies infections. The data also showed that the assessment of RA symptoms should be included in the long-term follow-up of patients with scabies. Background: There is no consensus regarding optimal treatment of spontaneous intracerebral hemorrhage (ICH) till date. The role of surgery in managing spontaneous ICH is debatable because of lacking clear benefit as compared to conservative treatment. The aim of this study is to assess the clinical efficacy of minipterional craniotomy in the treatment of hypertensive putaminal hemorrhage (HPH). 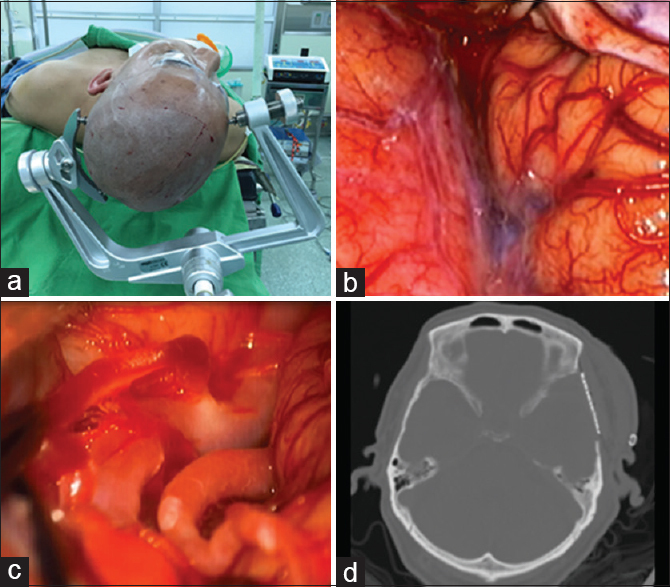 Materials and Methods: From January 2015 to December 2015, four patients with large HPHs accepting minipterional craniotomies and transsylvian-transinsular (TS-TI) approaches were analyzed retrospectively in terms of hematoma evacuation rate, recovery of consciousness, and short-term functional prognosis. Results: The average volume of residual hematoma was 3.68 ml with 93.53% evacuation rate. There was no delayed hemorrhage or newly developed hypodense lesion on postoperative images. Three out of four patients got clear consciousness with improved muscle strength of involved limbs on discharge from our institute. The modified Rankin scale grades were 3 at 3 months postoperatively. Conclusions: Minipterional craniotomy with TS-TI approach is a feasible procedure for HPH in selected candidate. The recommendation of this procedure is due to satisfactory hematoma evacuation rate, minimal brain damage, and improved functional outcome. Objective: Estrogen possesses vasoprotective effects and its deficiency has been implicated in the pathogenesis of postmenopausal hypertension. Reduced matrix metalloproteinases (MMPs) activity is accompanied with extracellular matrix (ECM) accumulation in large arteries, leading to the hypertensive arterial remodeling in resistance arteries. 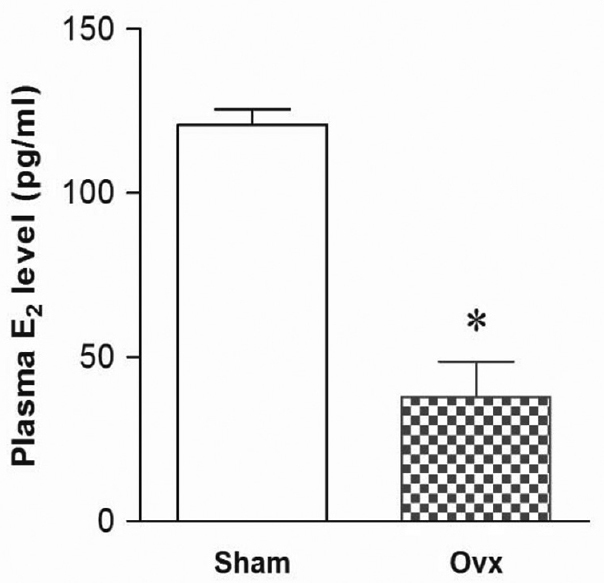 In the present study, we investigate whether estrogen deficiency induces alteration of MMP-mediated cleavage of vascular collagen in rats with ovariectomy (Ovx). Materials and Methods: Adult female rats were ovariectomized bilaterally to induce estrogen deficiency. Evolution of systolic blood pressure, diastolic blood pressure (DBP), and mean blood pressure (MBP) was monitored weekly until 12 weeks after Ovx in conscious rats. The vascular reactivity and time-course changes of collagen type I, MMP-2, membrane type 1-MMP (MT1-MMP), and tissue inhibitor of metalloproteinase-2 (TIMP-2) protein expression in mesenteric arteries were evaluated. Results: Compared with sham group, DBP and MBP significantly increased 5 weeks after Ovx, lasting to at least 12 weeks. Acetylcholine-induced vasodilatation of precontracted mesenteric rings significantly reduced 9 weeks after Ovx. Collagen type I accumulation in mesenteric arteries appeared 6 weeks after Ovx, which persisted till 12 weeks. The levels of latent and active MMP-2 did not show significant change until 12 weeks after Ovx. Moreover, MT1-MMP significantly downregulated during 1–4 weeks and soon recovered to normal levels. TIMP-2 reduced at 4th week and gradually returned to normal levels during 6–12 weeks. Conclusion: Long-term estrogen deficiency results in a shift in ECM profiles and diminished MMPs activities, leading to remodeling of small arteries, which may be associated with postmenopausal hypertension. This study provides new insight into the pathophysiology of vascular remodeling in estrogen-deficient conditions. A 32-year-old female patient at 32 weeks of gestation presented with persistent agonizing epigastric pain with vomiting from conception. CA125 levels were raised and a second look ultrasound scan revealed a viable fetus with a right-sided ovarian mass. Preterm vaginal delivery at 32 weeks resulted in a viable infant. Excision of the ovarian mass revealed Krukenberg tumor (KKT). The other ovary was grossly normal. Ovarian malignancy in pregnancy is a rare phenomenon, more so is the KKT. The infrequency, initial unilaterality, and the low power view misled identification at first. Periodic acid–Schiff and mucicarmine histochemical staining clinched the diagnosis. Pulmonary tuberculosis (TB) is a major health problem worldwide. Hypercalcemia has been described in patients with TB. Symptomatic hypercalcemia is treated using aggressive hydration and short courses of systemic corticosteroid to decrease serum calcium levels. The duration and dosage of steroid treatment are not well established. The present report describes a case of a 66-year-old man diagnosed with pulmonary TB, who received anti-TB therapy for 4 months, after which he presented with an episode of hypercalcemia with acute kidney injury. Systemic corticosteroids were prescribed for 8 weeks and gradually tapered. Subsequently, the chest plain film revealed new infiltrates, and his hypercalcemia relapsed. Immune reconstitution inflammatory syndrome (IRIS) was suspected. Calcium levels normalized 1 week after the steroid was increased and the anti-TB drugs were maintained. Prednisolone was gradually withdrawn over a 1-month period and completely stopped during the 7th month of anti-TB therapy. The patient remained under observation for 1 more month, during which his calcium levels remained in the normal range. Therefore, the use of steroids for approximately 4 weeks might be suggested for TB-IRIS in HIV-uninfected patients. Although gastric outlet obstruction is a common condition, etiology could not be determined in a few cases by means of clinical features, radiological, and endoscopic examination, resulting in substantial diagnostic dilemma. A case is being described where a 30-year-old male presented with anorexia, dyspepsia, vomiting, low-grade fever, and weight loss for 2 months. Results of routine laboratory tests were within normal limit except elevated erythrocyte sedimentation rate. Abdominal computed tomography scan demonstrated a gastric outlet obstruction by an antral mass with mild enhancement of the area. 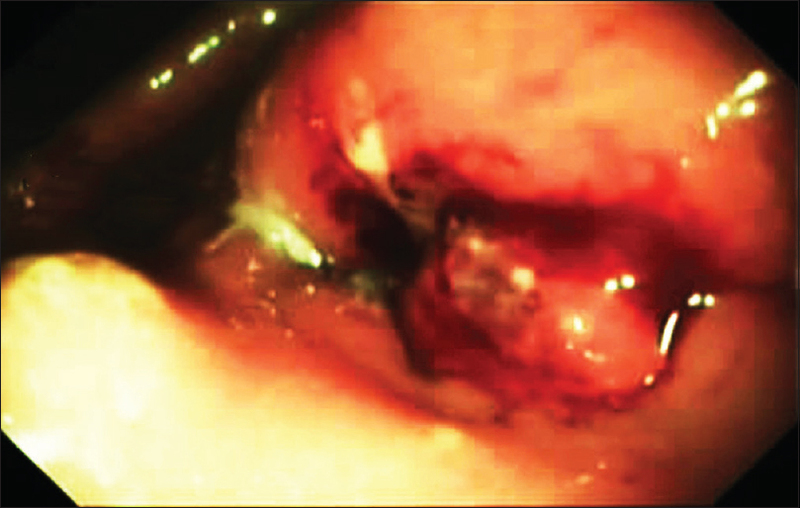 Upper gastrointestinal endoscopy depicted an ulcerated and friable mass with an irregular shape and surface at pylorus resulting in pyloric obstruction. Endoscopic biopsy revealed only chronic gastritis with regenerative changes of epithelium. As the patient was not relieved of obstruction by conservative management, Billroth Type II gastrectomy was done. Histopathological examination of the resected specimen revealed caseating granulomas with acid-fast bacilli. Finally, the patient was diagnosed as primary gastric tuberculosis after exclusion affection of other organs and antituberculous medications was initiated. A good response to antitubercular treatment was noted after 5 months. Stomach being an uncommon site of tuberculosis and as it can occur in patients with no risk factors or characteristic symptoms, diagnosis of such rare condition remains a diagnostic enigma.